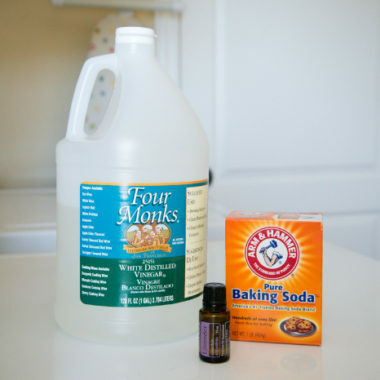 DIY Fabric Softener using things you already have around the house! Pour the vinegar into a large bowl. Add your essential oil, if using. I chose to use lavender since that seemed like a nice smelling fabric scent to me. Add your baking soda. When fizz has settled, pour into storage container of choice. Use up to 1 cup (depending on load size) per load. I poured mine right into the regular fabric softener location. Note: Prior to adding the baking soda, the oil sat on top of the vinegar. After pouring in the baking soda and letting it dissolve, the oil no longer sat at the top. Whalah! I had no issues with any oil spots on my clothes.